Facebook is deprecating posting to a user's profile on August 1, 2018 so this feature will be removed from JReviews. You should still create a Facebook App, or use an existing one for your site, for improved Open Graph, FB sharing and FB re-scraping functionality. 1 Which actions will generate a Wall post? The JReviews integration with Facebook allows you to create incremental traffic to your site, by posting user submitted actions to their Facebook walls. These will also appear in the newsfeeds of the user's friends which creates a viral effect. Which actions will generate a Wall post? Currently the actions supported by this integration are submissions of unmoderated listings, reviews and helpful review votes, which are similar to the "like it" functionality of Facebook, but for user reviews in JReviews. Helpful review voting will only generate a wall post if the user has already established a Facebook session; unlike reviews and listings, there's no practical way to ask the user to publish the vote to FB. If users log into your site via Facebook connect, then positive votes will automatically generate a wall post with the review the user liked. The integration will work with or without a Facebook Connect Joomla login. If your site already supports Facebook Connect login, via JomSocial, Community Builder or any other solution, then JReviews is able to identify the Facebook session for the current user and use it to submit directly to his Wall. This is transparent to the user. When the user clicks on the checkbox or FB button the Facebook Popup will appear requesting login information or publish stream permissions or both. This button will only appear for users not logged in via Facebook or users that haven't granted publish permissions. If you decide you want to allow users to opt-out of publishing the submissions to their Facebook wall, you can enable the opt-out setting in the JReviews configuration for Facebook. In the JReviews configuration, under the Community tab you need to enter a Facebook Application ID and Secret strings. 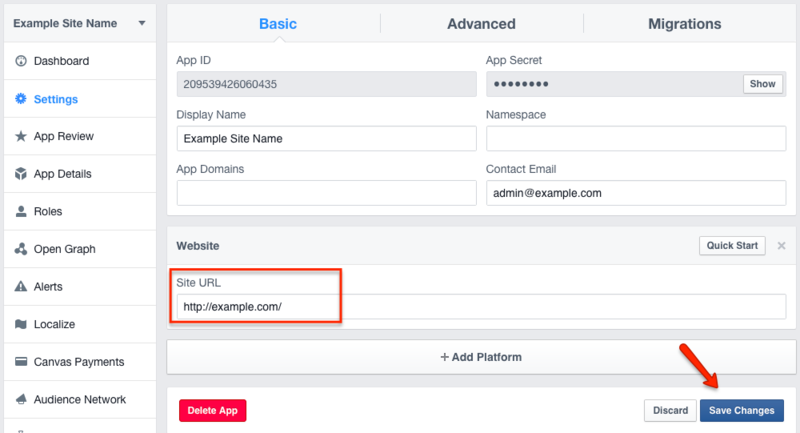 If you already have a Facebook application for your site login, then you can use the strings from that application, otherwise you need to go to https://developers.facebook.com/apps and create a new application. Select a Category that your site belongs to and click Create App ID. Next you will get Facebook's security check. After you pass the security check, you will be redirected to the app dashboard page. Choose Website on the Add Platform popup. In the Site URL setting enter your website url and click Save Changes. Finally, Facebook requires that you submit the publish_actions permission for approval within the Facebook App. This can be found in the "App Review" page. As the administrator of the App you can test the process without the approval, but in order to roll out the feature to your users, the approval is necessary. You need to provide Facebook with the exact steps to make a submission on your site so they can test it. We recommend you use screenshots and share the links with Facebook either via Dropbox or any other method you know to share files via links. 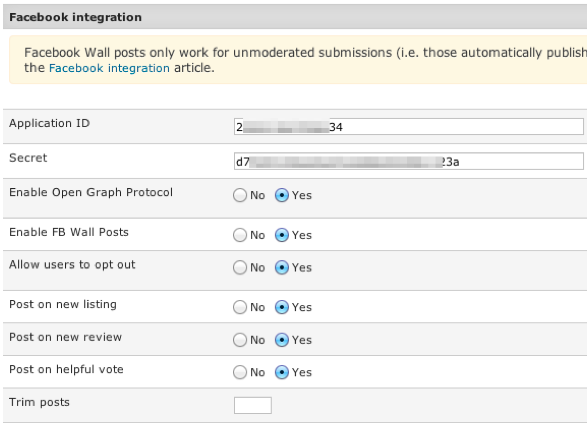 To test whether the integration is working, make sure you don't have an active Facebook session when using Facebook Connect to log in to your site. Go to the Facebook site and log out. Then go back to your site and navigate to a page where you can see the review form. Click on add review and look for the Publish to Facebook button as shown in the second image from the top. If it's not there, make sure you are accessing the site as a user for which moderation is not enabled because this only works without moderation. 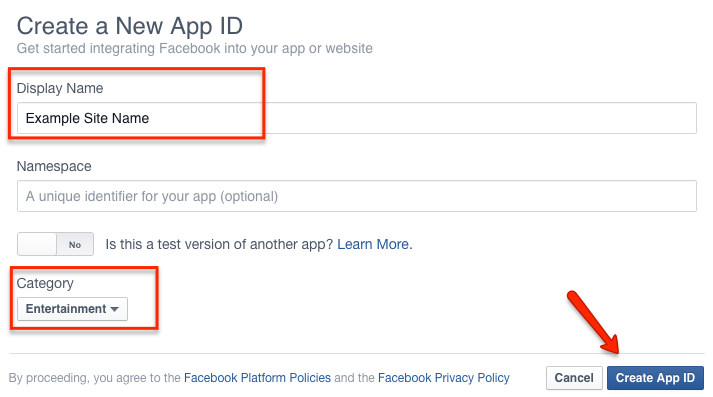 Make sure you used the Facebook Application ID in the configuration instead of the API Key. Components like JomSocial use the API Key; therefore just copying your settings will not work. Make sure you disabled the moderation for listings and/or reviews for the user group for which you are testing this feature. The FB integration only works with unmoderated submissions.